This section is gathering all presentations of the CHOReOS project given in scientific or industry events. Pierre Chatel, Thales, presented CHOReOS in the Project Spotlight Session. Presentation Title: CHOReOS: Large Scale Choreographies for Futur Internet, from theory to practice. CHOReOS is now an OW2 project, it was accepted by the OW2 Technology Council in November 2012. Discover the slides of the CHOReOS presentation at OW2con'12. The CHOReOS project was presented during the conference. The presentation title was: "Choreographies: A great new world of mobile, personalized services. The CHOReOS approach"
The CHOReOS ‘Large Scale Choreographies for the Future Internet’ European FP7 –Objective 1.2 project started in October 2010 and is directly linked to OW2 Future Internet initiative. Indeed, CHOReOS-developed concepts and technologies are specifically targeted to solve enactment of service choreographies in an Ultra Large Scale context: this covers being able to ‘execute’ choreography specifications over a network of discovered, dynamic, Business and Thing-based services. Over its past first year, the project has consolidated its technical foundations (CHOReOS dynamic development model definition, CHOReOS middleware specification, Specification of the CHOReOS IDRE) and delivered the specification of its three use cases ("Passenger-friendly airport", "Mobile-enabled coordination of people", "DynaRoute"). This presentation will cover both these recent achievements, but will, first of all, give to the audience all the necessary keys to understand the context and the main goals underpinning CHOReOS. Presentation of CHOReOS to the ANIKETOS project on February 22, 2012 to discuss possible exchange areas. 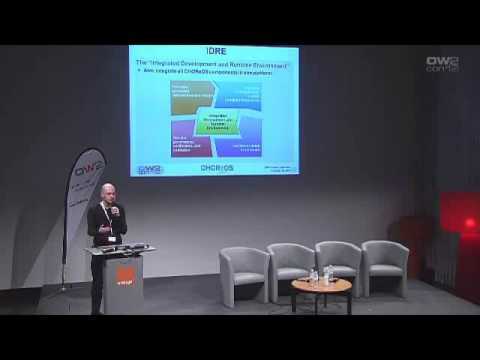 CHOReOS presented at the OW2con Conference on Nov 25-26 2011 in Paris by Pierre Chatel. Presentation of CHOReOS Web Services Orchestration given by USP (University Sao Paulo) at FISL Conference, Brazil, June 2011. CHOReOS Web Services @ FISL Conference, Brazil, June 2011 Discover the presentation "ChoreUnit: Testing framework for Web Services", given by USP (University Sao Paulo)at FISL Conference, Brazil, June 2011. Download the CHOReOS Industrial Exploitation Plan as of May 2011. Download the CHOReOS presentation given during the ACM / IFIP / USENIX 11th International Middleware Conference, Bangalore, November 29 - December 2, 2010.